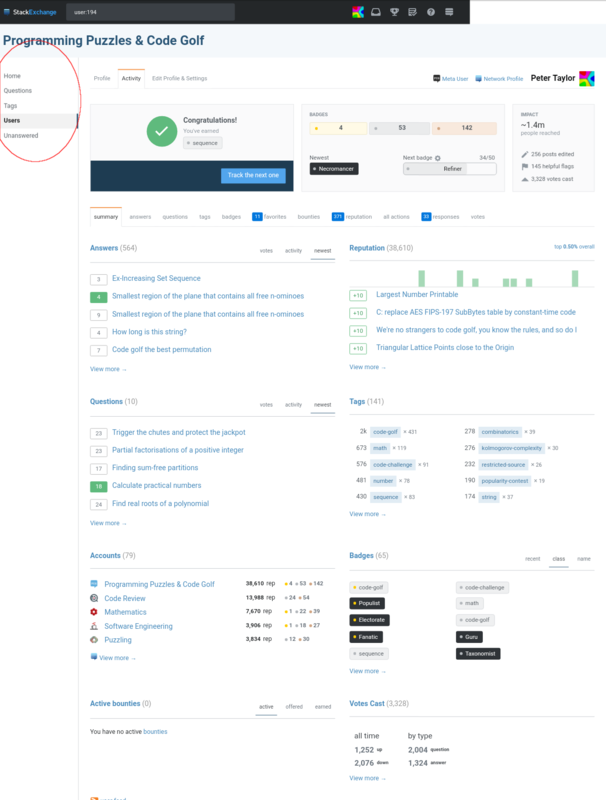 We are rolling out the new "stock theme" to the Stack Exchange network. You all are the lucky first site to get the new theme. It is now live. How does Code Golf get its own custom theme? One of the goals of this project is to make customizing sites easier so that all sites can have a personalized look (within limits). First we need to convert all current sites to the new unified theme format. Once that is done we will announce the timing and process to roll out personalized themes to sites using the stock theme. We are hopeful this will happen later this year. Please help us look for issues/bugs. This theme will ultimately be rolled out to 100+ sites. So, it is important to do this trial to make sure things are working well. Please post any issues you see as answers below. I have extremely light-sensitive eyes, to the point that I sometimes even need to wear sunglasses indoors. As a result, I have my monitor brightness set to absolute minimum. On this setting, it's extremely difficult to distinguish between "voted on this" vs "not voted on this." The two colors are almost the same. Raising the brightness (to an uncomfortable level), I can see that the "activated" vote button is a slightly blue-ish shade of grey compared to the unactivated vote button, but the difference is negligible. Can this be updated to present a bit more contrast between the two states, like is done on the Meta design? This makes me feel like I'm doing something wrong. I think the blue highlight is enough, similar to how it looks when editing an answer. Image taken from How much is my dice matrix worth?. 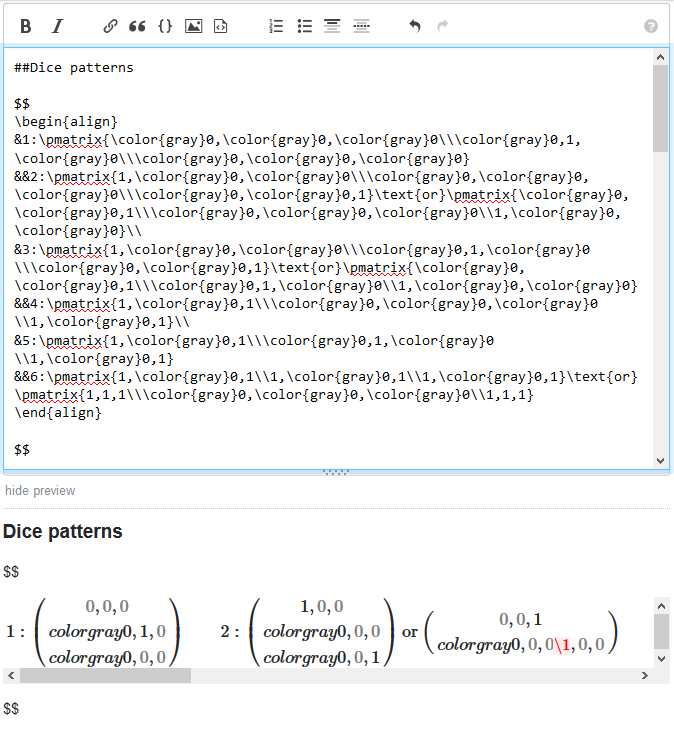 Image taken from Calculate the number of primes up to n and provided by DJMcMayhem. This happens at least on the Chrome browser for Windows. status-review I've logged a bug for this, but it is unrelated to the theme change. Similar problems exist with resizing the window while adding tags - it's easy to end up in a state where you can barely see any tags, even though there's plenty of room. If you delete the last visible tag, the rest do finally scroll back, but it should scroll back long before that. The meta label on the meta site has very low contrast which makes it difficult to read in glare or for those who have harder time seeing low-contrast text. Also it feels unnatural with "meta" being so close to the other text, not sure if by design but 16px seems to make everything feel more natural. and as far as I can tell there's no reason for the font size to change at all, because the search box size isn't changing. this feels awkward when navigating between the pages as the two similar elements have different styles. Again, this might be intentional. But even if it is, it gives the feeling that it's a rendering bug -- and doesn't help counting the number of spaces anyway. status-bydesign Hiding of left nav is a feature of being signed in. I have hidden the left nav in my preferences on PPCG. 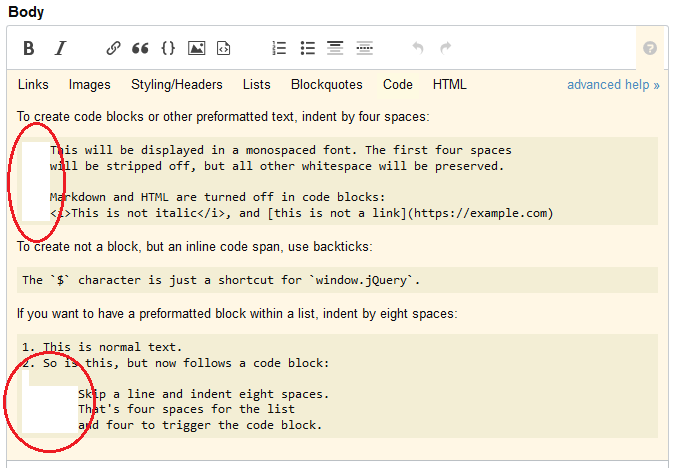 (As I need a large font for my eyes, it is (so far) the only issue with the new theme I've found unacceptable.) This setting is supposed to be global, and indeed seems to work automatically for StackOverflow where I have already joined. 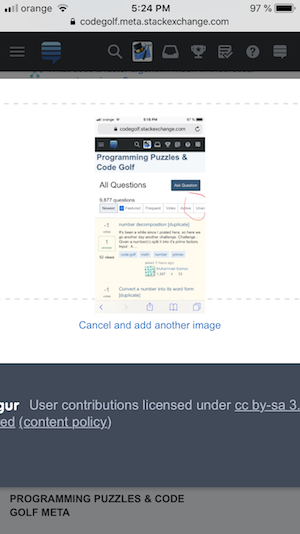 However, it does not work for me on Meta StackExchange - the left nav is still shown there. I assume the difference is that I have never joined that site. Joining to test... Yep, that was it, now it's gone. This may be easily fixed for a single site, but I often follow links in Hot Network Questions to sites I don't otherwise use, so I foresee that this would become annoying once the new themes start getting rolled out to all sites. EDIT: Well, that is a disappointment. I don't generally frequent sites that ask me to register just to make their content bearable to read, which means this will discourage me from visiting other SE sites than those I am already registered at. Note that I am signed in, just not to every single site individually. And those sites still show the top menu bar with my account's notices etc., so it's not like you couldn't somehow get hold of my global preferences. Is the top-right/bottom-right border radius on the badge progress bar intentional, or is it accidental? It does look weird to me. 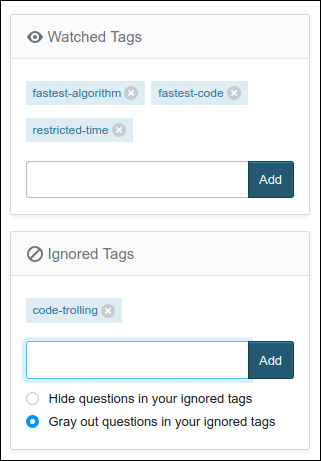 Tag synonyms are indistinguishable from tags with no usage guidelines and 0-1 answers. 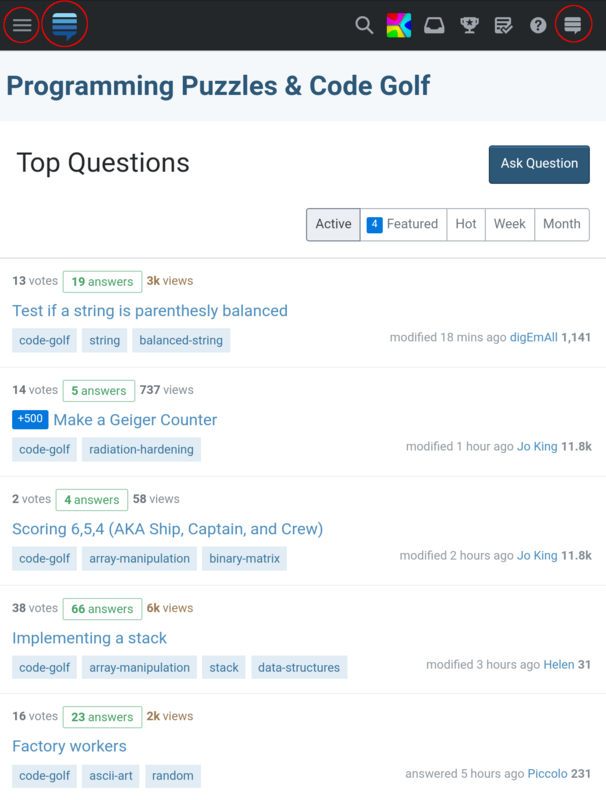 Moreover, tags with 0 answers are indistinguishable from tags with 1 answer. On this page, compare anagrams, array and birthday-problem. anagrams is a synonym for the very popular tag permutations. array has no questions at all, which raises the question of why it's on the search page at all. And birthday-problem was just created, and so has 1 question and no usage guidelines. Also, on any tags with no usage guidelines, the "n asked this year" information is missing. For instance, on page 2, cards has had 2 questions asked this year, but that information is not displayed. I have poor eyesight, and as a result I browse Stack Exchange sites at 150% zoom level in Chrome. On most sites, I see the main content to the left, and to the right is useful stuff such as related questions, "featured on meta" and the hot network questions. In this new theme, because of my zoom level, all that stuff is pushed to the bottom of the page. This seems to be for the sake of fitting the sidebar onto my screen, but (at least currently) its content is vastly less useful than the right-hand column that it's displacing. It would be much better for the sidebar to disappear before the right-hand column does. status-planned This is a temporary artifact due to responsive NOT being ready for all pages. So, on a smaller viewport (like a tablet) the left nav will auto hide on some pages (responsive ones) but not others (non-responsive ones). This will be fully addressed when we make all pages responsive, but that will take some time. There is a curious inconsistency whereby on my tablet the left navigation shows on some pages (e.g. my user page) but not on others (e.g. the homepage). This leaves the homepage apparently with less functionality than it had in the previous design. 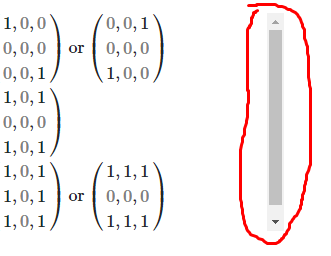 It turns out that it's still possible to e.g. list questions by criteria other than "Top", but it requires finding which of three "hamburger" icons (circled in screenshot above) opens the menu with that functionality, which I do not consider good discoverability. I regard this as a removal of useful functionality: previously it took one click to get to a list of questions sorted by Newest, but now it takes at least two, and one of them is not discoverable. status-declined Fixing existing MathJax issues is out of scope for the themes work. 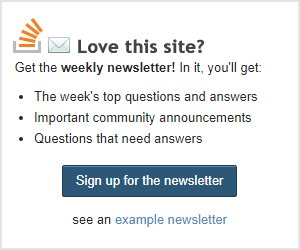 Welcome to Stack Overflow, sign up to our newsletter! 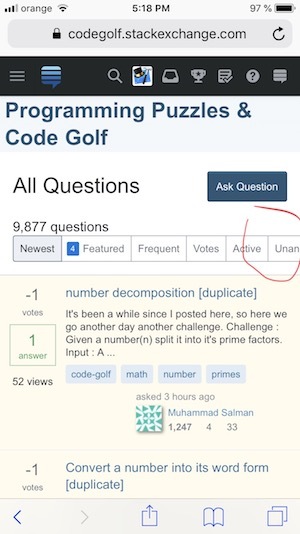 G Q goes to https://codegolf.stackexchange.com/questions as usual. After that, however, O A does not "sort by active". ? offers no option to "order questions" at all. status-planned Currently we still recommend you use the mobile view on small screen devices. There is a good bit of work for us to do to make the responsive pages work well on mobile. That work is planned but we don't have a firm schedule at this time. 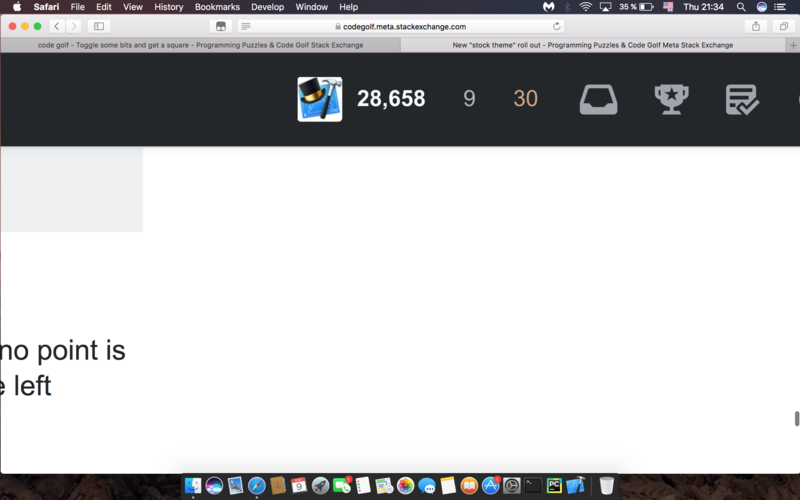 As I shrink the horizontal window size, various page elements are removed. However, at no point is the whitespace to the right of the left navigation text removed, up until the point where the left navigation bar is removed. The pop-up that appears when trying to upload an image cannot be scrolled, and you cannot actually insert the picture into the post. 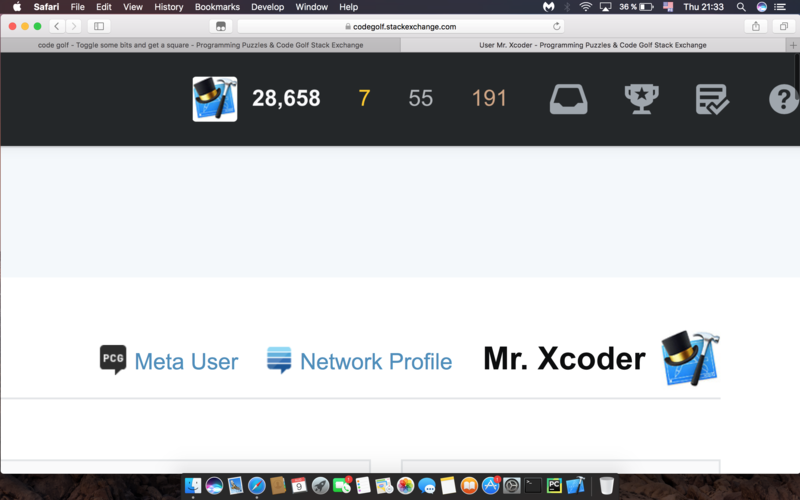 Although the 'Next badge' element is clickable, the mouse cursor is set to either default or text. All other badge elements set the mouse cursor to pointer when hovered over. I'm not sure if this is a bug or not, feel free to ignore if it's intended. There's the watched tags and ignored tags. If you click the edit button, you can add or remove tags. If you click anywhere else, the ability to edit goes away. However, if you click on the edit button of the other one (watched and ignored) then the first remains editable. This seems inconsistent and surprising. I've only noticed this in PPCG chat rooms so far, but if you hover over a question tag on the bottom most pixel, the entire tag button focuses and unfocuses forever. How are new users supposed to participate on this site? Would PPCG user interface design contests be out of place?